Leo is ruled by the bold and proud lion. 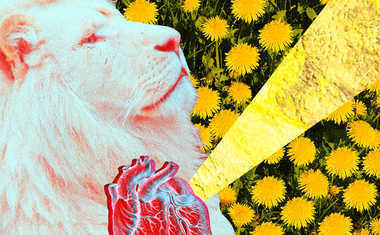 In the Strength Tarot card, the lion is the most prominent figure -- making this the most obvious connection between the Tarot card and the Zodiac sign. In addition, the card itself is wreathed in the colors of the fire sign Leo: radiant yellows and golds. 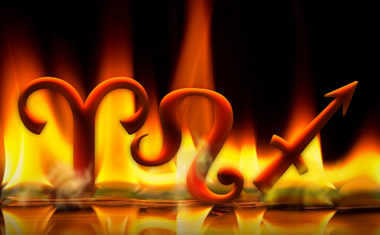 Leo is a Fixed and fiery sign known for being generous, warm-hearted, and loving. Confident and ambitious, however, Leos are also usually the center of attention. They can charm the pants of just about anyone! It’s never boring with a Leo around. Those born under Leo are fearless; both emotionally and physically powerful, their strength runs deep. 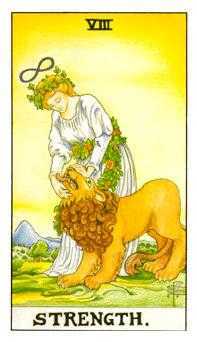 In the Strength Tarot card, this duality is represented by the bold lion being embraced by teh gentle maiden. The heartfelt connection between them is especially important because in Astrology, Leo rules the heart. The maiden is dressed in a regal white robe with floral sash and crown to represent royalty, bravery, and honor -- all characteristics embodied in the zodiac sign of Leo. Above the Lion and the maiden, you can see the Roman numeral 8. 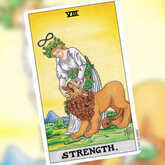 Strength is the 8th card of the Tarot deck, and August (Leo’s month) is the 8th month of the year. Also, in the sky above, there is an infinity symbol. The number 8 symbolizes karmic energy and generosity, so combined with the infinite symbol we get a sense of the limitless energy of this Tarot card! Each Tarot deck will depict the Strength Tarot card and it’s symbolism differently. What are the connections that you see between Leo and Strength in your favorite deck?